Where casual and independent games rule! Download the free trial here! Despite what the title might have you think, this game has nothing to do with Star Wars. Instead, this is the first in a five-part RPG series about a young peasant woman and her plans to bring a better life to her people. You are Marine, a peasant from the land of Myst (no relation to the classic adventure game), who lives in the poor village of Green Grass. After her father is injured by the ruling city of Mystrock, she sets out to gather thirteen warriors to invoke martial law - if her warriors can best Mystrock's best warriors in martial arts combat, they will be legally able to overthrow the current government and appoint more compassionate rulers in their place. This feat will take five games to complete, but the first chapter gets you excited for what's to come. As is typical in RPGs, Marine's journey involves plenty of battles, sidequests, and interesting locations, but there are also some unique elements in the gameplay. For example, Marine has the ability to jump across cliffs and even up mountains. Equipping a certain item lets her jump even higher to reach special items and hidden areas. It may be simple, but it's plenty of fun. The battles are in the typical turn-based style found in most RPGs, but they have a unique element as well. Early in the game, Marine meets a fairy named Jeanne, who takes a liking to her and settles down in her earring. During battles, Marine can summon Jeanne to help with the fighting, essentially adding an extra fighter to the party who can either attack the monster party or heal your party members. You can also choose strategies and equip certain items to give your characters special battle abilities. RPG's thrive on exploration, and Millennium certainly excels in that aspect. There are many locations to explore with plenty of hidden secrets, including secret rooms that hold treasure and hidden animal bosses. There are also lots of sidequests, some of which are difficult to find. In addition, the music is drop-dead gorgeous. Flutes, pianos, and even choruses create a magical atmosphere. The flaws in this game are few, but they still exist. For one thing, most of the monsters don't drop money. Only enemies like bandits (who might logically be carrying money in real life) drop money. I assume that the logic behind this is that animals and animal-like creatures have no reason to be carrying money in real life, but since in most RPGs your main source of income is battle spoils, this can be a bit of a problem. Fortunately, you'll find plenty of moneybags and treasure chests as you explore, but you'll still likely find yourself low on gold at some point when you might really need it. Also, if you buy the game from Big Fish Games (as I did) and possibly some other third-party sites, you'll be forced to play with random monster attacks. I hear that Aldorlea's official site has since added the ability to choose between random attacks and visible enemies, though, so I recommend getting the game from there. Overall, this is a fun, atmospheric, addicting game and a great start to an epic series. Any RPG fan should definitely try it out. Just be warned - you'll most likely be wanting to buy all five games after you play this one. Rating: 4 and a half out of 5 stars. Back to time management games with a unique find. I have a confession to make. I enjoy time management games, but I've never been a big fan of the Cake Mania series. Yeah I know, after Diner Dash, Cake Mania is one of the original time management games, but it just doesn't have the appeal to me that it does to other people. I found the first Cake Mania to be slow and repetitive, and while Cake Mania 2 had some improvements, it also had many of the same flaws as its predecessor. As such, I never bought the third game and when my computer was wiped and I lost my copies of the first two games, I felt no desire to ask Sandlot Games for new downloads, though I still intend to do so eventually. However, when I tried the demo of Cake Mania: Lights, Camera, Action, I was floored. Not only did I actually enjoy the game, but I immediately bought the full version. This game is fun, entertaining, and humorous. In this game, a movie is being filmed in Jill's hometown, which of course means plenty of customers for her bakery. In addition, Jill is pregnant, so her life is full fo chaos. Probably one of the things that got me interested in this game in the first place is the idea of a pregnant protagonist. The first part of this game plays like a typical Cake Mania game - you control Jill (and later her husband Jack) and send her around the bakery to bake cakes, frost them, decorate them, and give them to customers. However, after a few levels you'll unlock two more locations: a clothing store and a pizzeria, each of which hosts their own game. Yes, this game is actually three games in one, and they're all different. At the clothing store, you fulfill customers' orders by searching for certain items of clothing out of an ever-increasing selection; at the pizzeria, you prepare customers' orders by selecting different ingredients. Jill and Jack even occasionally visit the other locations. You can switch between the three locations whenever you want, meaning you won't get bored. The game's customers are an incredibly quirky bunch. You have staples like the impatient child, but you also have more unique types. How unique, you ask? Well, there are actresses who make everyone else so star-struck that they change their orders to match hers, Yetis who can freeze other customers, and superwomen who can turn other customers into mimes. The way certain customer types affect the other customers also adds a level of challenge to the gameplay. Overall, this is an amazingly fun game. It's a huge improvement over the original games and even those who aren't fans of the series should check it out. And if you are a fan of the series, this game shouldn't be a disappointment. (blows dust off blog) Well, after almost a year of neglecting it, I now declare this blog to be BACK FROM THE DEAD! And we start off with a new RPG. Midnight's Blessing is an interesting RPG that manages to blend a gripping story with large doses of humor. It drifts in and out of breaking the fourth wall while still taking itself seriously, making for a unique experience. You are Sidni, a young girl who delivers mail for her mother's postal service. She is enjoying her life until one night when mysterious strangers attack her home, burning down her house and kidnapping her mother. Who are they? And why can't they see Sidni even when they look directly at her? Sidni sets out on a journey to rescue her mother and discover the truth about her identity. As stated before, this game is rich with humor. It makes fun of RPG cliches, constantly breaking the fourth wall without feeling abrupt. There are also fun absurdities like a vigilante cat and various cameo appearances from other indie RPGs, including a not-to-be-missed cameo of Mel from Aveyond. However, there are also several pop-culture references to everything from Star Wars to The Terminator to Sesame Street to Twilight. Depending on your personal taste, you might find them amusing or you might find them off-putting. In addition to the humor, the characters are very memorable. Sidni is a rare game protagonist with real personality. She is innocent, playful, and imaginative, and her dialogue is very memorable. The side characters are very interesting as well. There's Brenna, a ruthless monster hunter with a taste for violence, and Estradi, a vampire who struggles to retain his humanity. Even many of the NPCs are amusing and memorable. This game differs from traditional RPGs in that the towns don't have inns. There are maybe two spots in the entire game where you can heal your party, but for the most part you'll have to deal with there being no inns. This isn't as big a hindrance as it may seem, since every time a character levels up, all of his or her health and mana is restored. However, depending on your gaming style, you might miss the security of being able to restore all your characters' health when you reach a town. In addition, some of the battles, especially the boss battles, can take a very long time to complete and sometimes they get tedious. The characters can learn awesome skills, so most of the battles aren't all that difficult, but they can get very long. But those are little flaws. Overall, Midnight's Blessing is a memorable experience with fun characters and gameplay. It is definitely recommended to people who enjoy lighthearted RPGs. Back again. Seems like I always have to apologize for my absence. Anyway, this week we've got a brand new RPG from our friends at Eridani Games and Amaranth Games. Sometimes the game thrusts you into a new location without giving you notice. Legend says that the land of Edolie was created by Lady Edelia on her wedding day. She created it to be a world of wonders where people could live in peace. But has the legend been twisted over time? Is there a darker side to the creation story? You are Willow, a young aspiring writer who lives in Edolie. She and her tree sprite friend Tye go to visit a nearby island village for the annual Harvest festival. However, during the festival, mysterious creatures attack the town, and then the next morning, no one except Willow, Tye, and their new companion Rys have any memory of the creatures. Worse, Rys's sister Eirwen is accused of causing the damage and arrested. Edolie is a rich RPG full of appealing characters and fascinating locations. Throughout their journey to discover the truth and clear Eirwen's name, Willow and her friends visit a village where everyone is over cautious about safety, a dwarf mining colony, and a city of talking ants (yes, talking ants). Every location will have many sidequests for our heroes as well, and the sidequests are wonderfully varied. There's a quest to find a pirate hideout, a quest, a quest to find orphan ants to be adopted, and a quest to win a scarecrow building contest. In addition to the sidequests, there are secrets to discover, most notably the Troll Trees. The Troll Trees are scattered around Edolie and each one houses a troll who will give you a clue about how to find a hidden item or area. To add to the fun, the trolls are also named after members of either the Eridani Games or Amaranth Games forums (yes, I'm a troll - look for the troll named Esme Amelia - that's me!). The game has variations that encourage replayability. Early in the game, Willow is asked to write a book about some aspect of Edolie, and there are multiple subjects you can write about, each of which will influence the type of ending you get. There is also a possible marriage for Willow, but you will only get it if you make the right choices at certain points. Unfortunately, the game has one major flaw that dampens the experience. If you move on to a new chapter of the story without completing all the sidequests in the previous chapter, you won't get a chance to complete those quests later. This wouldn't be so bad if the game gave you a bit of warning beforehand, but you never get a warning. Many times your party will literally be dropped in a deep hole all of a sudden, cutting off any unfinished quests. It would be more considerate if the game gave a warning that you couldn't return after entering a certain area. Overall, Edolie is a highly enjoyable game. It's charming, atmospheric, and immersive - pretty much everything you want from an RPG. Here's hoping for a sequel. Now we have one of the greatest time management games of all time. Breakfast, lunch, and dinner levels. 120 regular levels and 120 "Expert" levels. Almost no difference between the lunch levels and the original Burger Shop. Expert mode has no storyline. Ages ago, I reviewed Burger Shop and gave it a five star rating. Burger Shop is a fun, hilarious, fast-paced game that's full of surprises and replayability. so as you can imagine, when the sequel came out, I immediately bought it. And I wasn't disappointed. Burger Shop 2 has all the addictive gameplay and humor that made the first game so memorable, along with various additions and improvements that keep the sequel from feeling repetitive. The story is that you wake up in a dumpster with no memory of how you got there. As you try to figure out what's going on, you find that the burger restaurants you opened in the first game are in shambles. Your task is to get those restaurants going again and make them better than ever, and hopefully you'll find out what happened along the way. The gameplay is the same as the first game: customers give their orders and you prepare them either by putting together ingredients or using machines. In the previous game, you served typical fast food like burgers, fries, ice cream, and soda. In this game, you still sell the fast food entries, but only at lunchtime. The levels alternate between breakfast, lunch, and dinner, with each mealtime offering different choices. You can serve pancakes at breakfast, pasta at dinner, and the good old burgers at lunch. There are also new machines such as a toaster and an oven. There are also new customers, such as the ninja, who orders breakfast, lunch, and dinner at the same meal, and the mime, who always orders what the person before him ordered. Along with the new customers, all the old customer types from the first game return, which should make for some chaotic gameplay. The game continues the clever humor from the first game, which makes the game all the more enjoyable. However, it would be nice if the lunch levels had more new stuff - they are virtually identical to the levels in the original game. You can put cheese and green onions on the salads now, but other then that the lunch levels don't offer any new menu items. It would be nice if the lunch levels had some new stuff. There could be things like ice cream cones, wraps, veggie burgers, fish burgers, hot dogs, lemonade, or wings, but instead we have the same menu items from the first game in the lunch levels. But that's only a minor flaw. All in all, this is an excellent game, possibly the best time management game on the market. It is entertaining, fun, and challenging. If you like time management games, this is a must-buy. I realized that I never finished reviewing my beloved Aveyond games. Well, no time like the present. A house where your characters can chat with each other. Spy agencies where you solve puzzles to learn new skills. You can't visit the inn or the shops right before the final battle. In Aveyond: Lord of Twilight, a young thief named Mel was tricked into stealing the Orb of Darkness, a magical orb with the power to destroy light by a vampire named Gyendal. Gyendal's sister Te'ijal rescued Mel, but failed to get the orb back. But all hope is not lost, because there's a second orb, the Orb of Light, which can put a stop to the Orb of Darkness's power. As Lord of Twilight ended, Mel and her friends were just beginning their quest to find the Orb of Light. Aveyond: Gates of Night begins right where Lord of Twilight let off. Just like the previous Aveyond games, Gates of Night is loaded with sidequests, humor, entertaining characters, and a sense of adventure. Your main quest is to locate the four Quarter Keys, which will grant you access to the land of Naylith, a village of butterfly people who guard the Orb of Life. The Quarter Keys are (of course) hidden all over the world, which means you'll get to visit plenty of interesting lands. As we've come to expect from the Aveyond series by now, the locations are beautifully atmospheric. You even get to visit some of the locations from Ahriman's Prophecy such as Tar Vedron, Venwood, and Faiara. The music and sound effects are still downright beautiful. The party interactions in this game are highly entertaining. Each member of the party has a distinct personality and they chat, bicker, and fight throughout the game. You can buy a house where the characters can interact and there are even four different marriage endings for your party member Prince Edward. As is typical for the Aveyond series, there are plenty of sidequests that keep things interesting until the end. They range from winning a game in a vampire casino to outwitting a cheeky fairy to freeing an orc from prison. The spy agencies and the Moo Hatchery eggs continue in this game as well with new puzzles and new eggs. Overall, this game is amazing. While it works best if you've played Lord of Twilight first, it is also a rich experience on its own. The story has plenty of twists to keep you interested and it gets you attached to your characters. Best of all, the Orb of Magic storyline is only at the halfway point. This week, a Match 3 game with a twist. We don't see too many games about art restoration, probably because most people would consider it a boring subject to make a game about. However, Restoring Rhonda manages to make it interesting, though you won't learn too much about actual art restoration. You are Rhonda, a young woman who has just been fired from her job as an art restorer at the museum. As a result, her confidence is at an all-time low, but then she finds a mysterious puzzle game called Azuba. When she solves Azuba's puzzles, the game rewards her with magical restoration tools. The bulk of the game is spent playing Azuba, which is basically a clone of BeJeweled. You're presented with a grid of different colored jewels and you have to swap them in order to match three of a kind. However, this game offers you two modes of play. There's the standard mode, where jewels must be adjacent to be swaped like in a traditional match-3 game, but there's also a mode where you can swap jewels anywhere on the board. This offers some variety, but not enough. The levels quickly become repetitive and there are only three types of special tiles. Depending on how many matches you made, the game will reward you at the end of each level with either a bronze, silver, or gold tool that you can use to restore paintings. The restoration part of the game is where it really shines. You might use a spray can to touch up paint scratches or you might use a needle to sew up the canvas. While the restoration minigames are very simple, they are still great fun. There's something appealing about watching a picture take form as you restore it. The game also contains a good deal of humor. Many interesting characters drop off pictures to be restored, including an Italian gangster and a computer nerd. Rhonda's wisecracks about the state of the pictures get a little tiresome after a while, but the game still manages to be funny. While not an amazing game by any means, Restoring Rhonda is still an entertaining way to pass the time. Fans of match-3 games and fans of art should give it a try. Rating: 3 and a half out of 5 stars. I LIIIIIIVE! Yes, after MONTHS, I'm finally writing here again! In the sequel to Azada (see my review on that game), Titus summons you once again to help him out. This time, the magic of Azada has cursed an entire library, making the characters sentient and trapping them in their stories. You must travel inside each book and help the characters solve their problems in order to break the curse. Each book involves puzzle solving, finding items, and talking to characters. You'll meet several classic literary characters such as Long John Silver, Sherlock Holmes, Hansel and Gretel, and many more. Every few books, you'll be asked to round up the "suspects" (characters) and search their portraits for curse symbols using special colored lenses. The suspect puzzles are fun, but they can also get repetitive. As with the first game, the artwork and music are beautiful. The music is once again reminiscent of the Harry Potter score (but sadly, Harry doesn't make an appearance in the game), which gets you pumped up for solving magical puzzles. The graphics are painterly and resemble storybook illustrations, which of course is fitting for the subject matter as well as being quite pretty to look at. Now since you meet famous fictional characters, that must mean you travel into classic books such as Treasure Island and Frankenstien, right? Well . . . you travel into books that are clearly meant to be these classic stories, but for some reason or other they have bland titles. For example, Dracula is called "The Vampire," The Adventures of Sherlock Holmes is called "The Detective," Around the World in 80 Days is called "The Journey," and Hansel and Gretel is called "The Witch." Why? I have no idea. These stories are in the public domain, so it's not a copyright issue. Why couldn't they just use the regular titles? It may be a nitpick, but using these bland titles instead of the correct ones takes a tiny bit of the magic away. In the previous game, you couldn't turn off the timed gameplay, but thankfully this game lets you choose between timed and untimed. That's the good news. The bad news is that they also removed the hint system. If you got stuck in the first Azada, you could get a hint in exchange for five minutes on the timer, but that's no longer the case in this game. You can earn orbs as you progress, but they can only be used to skip minigames. If you need help finding an item or you're not sure where to go next, there's nothing to help you. But those flaws are minor. Overall, this is a beautiful, engaging game with an ending that leaves you on edge for the next chapter. Unfortunately, that third chapter never came. Yes, a game called Azada: In Libro was eventually released, but it didn't continue the storyline of the previous games and turned the format into a standard hidden object game instead of a puzzle game. In fact, other than Titus showing up, Azada: In Libro has nothing to do with the previous games, which really feels like cheating the players. 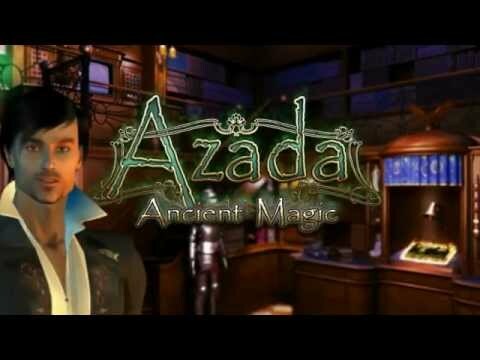 Although Azada and Azada: Ancient Magic are both great games, we may never know how the story ends. I really, really hate computer trouble. But I'm STILL writing, even if it's only once a month or whatever. A large variety of challenges. Getting three stars on certain levels can be nearly impossible. It's hard to be fresh within the time management genre. Far too often, a time management game might have a good concept, but then turn out to be yet another Diner Dash wannabe minus the charm and addictiveness. However, every so-often there will be a time management game that breathes new life into the genre, and Miss Management is one of those games. You are Denise, a young woman who has just taken a job as an office manager at a large corporation. We're never really told exactly what kind of corporation it is, but that doesn't matter. What matters is that Denise meets a bunch of coworkers, each with a distinct personality that influences how they work and relax. It's Denise's job to make sure that no one gets stressed out while at the same time making sure the work gets done. The gameplay involves delivering tasks to the employees and sending the employees to various spots of interest in the office when their stress level gets too high. Rather than trying to make a certain amount of money, each level has a list of challenges that must be accomplished in order to complete it, as well as some optional challenges that will earn you an additional star. A challenge may involve any employee having to do anything from relaxing at their favorite spot for a certain amount of time to completing a certain number of tasks. Stress is your main enemy in this game. Along with the normal stress from working, certain employees are more easily stressed than others and different things, such as coworkers goofing off or the radio playing, can stress out different employees. This is complicated by the fact that most levels will require things that stress out certain employees. Fortunately, there are water coolers, couches, video game machines, and other places where they can relax, plus you can buy food to lower their stress, but if they relax too long their tasks will become overdue, which raises your stress. Every level begins and ends with a cutscene of the employees interacting and their personalities and expectations clashing. The characters are very well-developed and very memorable. There's Mahavir, a lazy ladies' man, Tara, a shy artist, Timothy, a strogonoff-loving stresspot, and many more. Not only are the cutscenes very entertaining, but you actually get to see the characters grow over the course of the game. A character who starts out grouchy may learn to relax or a character who starts out addicted to work may learn that there's more to life. Unlike many time management games where you simply take over one restaurant/beauty salon/store/whatever after another, this one actually feels like it's telling a story. The only real flaw in this game is that it gets very difficult to earn three stars in the later levels. The first star comes from finishing the level, the second star comes from completing all the optional challenges, but the third star comes from finishing all the challenges (both required and optional) in a certain amount of time, which can be nearly impossible in certain levels. However, that's not to discourage anyone from playing. If you like time management games, I can say with certainty that you will enjoy this game. At least this time I have a valid excuse for being late. My internet connection was down for a long time. A large selection of rides and attractions. "Zones" that increase your profit. No way to rotate the view. The many objectives leave little room for creativity. It takes a long time to regain "hearts." When I was a teenager, one of my favorite games was Roller Coaster Tycoon, a game where you could create your own theme park and take on the challenges of managing it. Simple to learn and complex to master, Roller Coaster Tycoon (along with its add-ons and sequels) was an instant hit and I spent many hours with my virtual parks. It's probably unfair to compare a large-budget game with a small indie one, but Dream Builder: Amusement Park uses the same concept as Roller Coaster Tycoon, minus a whole bunch of the features that made it such a great game, and since it's such a classic and well-known game, comparison is pretty inevitable. You can guess the premise of Dream Builder: Amusement Park - you're given the task of building and maintaining your own theme park. You have various rides, attractions, concessions, and other stuff at your disposal, and you can unlock more choices through research. Throughout the game you will be given many different challenges to complete, such as "Have one Ferris wheel with Great appeal in your park" or "Have three restaurants with Amazing appeal in your park" or "Market to six different groups of people." Appeal is an important factor in this game. Sometimes the challenges will require your rides to have a certain appeal level, and other times your park just needs high appeal in order to regain "hearts" which are needed for most construction projects. You raise rides' appeal by placing decorations such as flowers and statues near them, but unfortunately, sometimes you might be more concerned with raising appeal than with being creative, which can result in a haphazard appearance. More importantly, even when all your rides have a high appeal, sometimes it will take a long time to regenerate enough hearts to build something, and nothing's more frustrating than just staring at the screen and waiting until you can do something. One of the game's more creative features is its assortment of "zones." "Zones" are groups of three rides or attractions that share something in common when placed close together, and everything built in the zone gets a profit boost. You can use research for the game to tell you what goes in a certain zone, or you can choose to experiment and try to figure it out yourself. Some of them like the "Snack Zone" and the "Dark Zone" should be pretty easy to guess, but others like the "Early Bird Zone" or the "Vista Zone" might be more difficult. Remember, anything might be part of a zone, even bathrooms. The graphics are bright and colorful and combined with happy carnival music to make for a cheery atmosphere. However, as your park grows, there will inevitably be spots where you have difficulty seeing through everything, which can make alining footpaths to new rides almost impossible. There is no option to rotate the view or make the rides invisible, which makes construction frustrating at times. More than once when I built a new ride the game would tell me it wasn't connected to the footpaths even though the paths appeared to be connected perfectly. If you've played Roller Coaster Tycoon, you'll definitely get the feeling that this game was inspired by it. While Dream Builder: Amusment Park definitely can't hold its own against that great theme park building game of old, if you just see it as a fun little game with its own charm, you'll have a good time. However, if you enjoy this game you should definitely seek out a copy of Roller Coaster Tycoon as well.